I went full-on neurotic with this recipe. I tested. And tested. And tested some more. Poor me right? I had to eat all those delicious flautas. The horror. Each time they tasted great, but I’m a bit ruthless. I wanted them to be downright irresistable. It’s about time that veggies take center stage in a dish, and not just be an after-thought, slapped on our plates like a pile of sad peas. Not that peas are sad, but when you spend hours slaving over a main course only to microwave a small pouch of buttered peas and pour them next to your masterpiece of a main dish… well, that’s kind of sad. Veggies need love too! So, as always, I’m here to give vegetables first billing. Followed by cheese, glorious cheese. Oh come on – you knew that was coming! These cheesy Baked Black Bean and Sweet Potato Flautas are one of my most popular recipes ever, and for good reason too. I can't wait for you to try them! While you wait, combine corn, diced or minced peppers, and diced or minced onion with your black beans, garlic powder, chili powder, cumin, cilantro, cayenne, and taco sauce/salsa. If you prefer very tender veggies, feel free to saute the vegetables first in a little butter or oil to tenderize. Your cayenne and red pepper flakes will control the spice-factor; adjust those to taste. I alternate between using my favorite flavorful red enchilada sauce, spicy taco sauce, and a natural, zesty salsa like Mrs. Renfros Green Salsa, all have produced delicious results! Once your sweet potato is cooked, fluff the inside with a fork and add the flesh [minus the skin] to the rest of your veggies and mix thoroughly. Add salt, pepper, and any additional seasoning to taste. I usually add a little extra sprinkle chili powder, cumin, and garlic! Next, working in small batches of maybe 3-4 tortillas, wrap corn tortillas in a damp paper towel and microwave on high for 30 seconds. Follow it up with an additional 30 seconds, if needed. The goal here is to steam the tortillas so they roll into perfect flautas without breaking or cracking =) This trick works like a charm! Immediately spray or rub one side each tortilla with oil and add "line" of veggie filling to the center of the "dry side" of each tortilla, about 1-inch thick. Top it off with a layer of cheese [as much or as little as you want! if you're using cream cheese as well you can mix it into the shredded cheese before topping] and roll the tortilla. Place on a wire baking/cooling rack and seal with a toothpick, if needed. Repeat these steps until you have a rack full of flautas. Give them one more teeny spritz of olive oil to get them extra crispy [no-frying! whoo!] 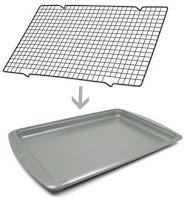 and set the rack baking sheet lined with aluminum foil. 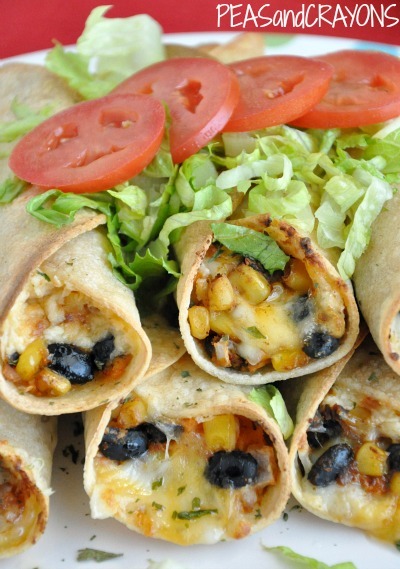 The wire rack elevates the flautas and allows them to get nice and crispy on both sides. If you don't own a wire rack, simply place the flautas on aluminum foil after spraying and turn over halfway through cooking so both sides will get a chance to crisp up. Uber easy! Bake on the middle rack, at 425F, for 15 minutes. At the end, set to broil on HIGH for just under a minute to crisp the tortillas into a perfectly golden, crunchy shell. Pile high with any + all veggies you have on hand and serve with plain greek yogurt, salsa, and guacamole for dipping! You can even whip up a small bowl of jalapeno ranch for dunking too! If you have any fresh lime or cilantro both will make a tasty garnish! * My favorite cheese options are habanero cheddar, sharp cheddar, and/or Pepper Jack! VEGAN CHEFS simply skip the cheese and add a little extra taco sauce or salsa to the mix. I made a vegan batch along with the cheesy ones and LOVED them! Try these fab flautas with pumpkin or butternut squash if you’re out of sweet potatoes or simply want to mix things up a bit! I also love them with my vegetarian triple-bean filling. No corn tortillas? No problem! Traditional flautas are made with flour tortillas, so feel free to use those as well! Any way you roll them, they’re delicious! I use my Nonstick Wire Cooling Rack to help the flautas bake themselves to crispy perfection. Elevating the tortillas allows them to get uber crispy on each side, without me having to stick half my body into the oven to flip them. Considering I’m borderline the clumsiest person every, these cooling racks are a lifesaver! I suppose they also come in handy for baking too. so . . . how are they?! Amazing! 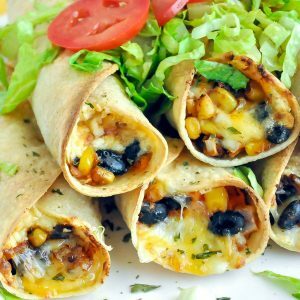 These baked flautas were crispy, crunchy, cheesy, and savory with a hint of sweetness from the potatoes! Stick a fork in me – I’m done! Whip up these easy cheesy baked black bean and sweet potato flautas as tasty game-day snack or a festive alternative to taco night! They’re great with pretty much everything… especially guacamole and a hearty veggie salad. If you get a chance to try these Baked Black Bean and Sweet Potato Flautas, let me know! These were great! I made 90 and they turned out amazing! My very picky kids loved these! I froze the leftovers by wrapping each flauta in foil and then storing in a zip bag. When I need a quick lunch I unwrap and nuke for 1 min and they are delicious and still crispy! I used flour tortillas which came out great. I also made another variation with Trader Joe’s grilled lime chicken chopped and mixed with some salsa and sour cream. The family went nuts for those. The veggie ones are for me and I am so glad they made a lot so I can have them for lunch. Thanks for the great technique of using the rack to bake them — so crispy and delicious! 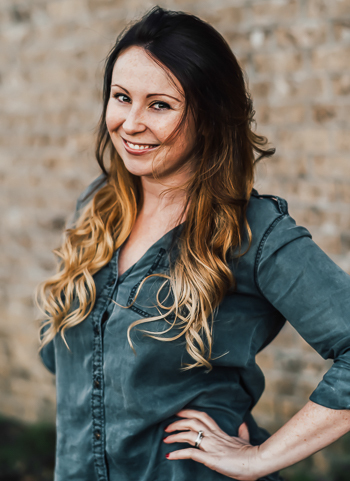 So stoked to hear it Cara – thank you!!! Great recipe. My 8 year old girl did’t care for them, but she’s always picky. I made them with flour tortillas that were also made with corn flour so I didn’t need to warm them first to roll. They still crisped up nicely. These are so delicious! I followed the recipe almost exactly and served with salsa, sour cream and guacamole. Will definitely make again! These were yummy! I recommend putting a cookie sheet underneath flautas to catch any falling filling if your oven racks don’t support the ends of your tortillas. I Will be making these again! OMG so delicious! These are amazing! The tortillas are so crispy yet not dry; excellent tip on spritzing them with oil before baking. My wife and I cannot wait to make and try these. My husband and I devoured these. Thank you for the great instructions and notes about alternate versions of this recipe –I had searched for butternut floutas and really appreciated your notes. A new house favorite, this was enjoyable to read and to eat! Declicious and easy. But my corn tortillas all split and break apart. I’ll use flour next time. Oh my gosh – I love these sooo much. I just made them and they are outstanding. I doubled the batch and seriously, I have lunch for a week, and then some. Thank you for this! Yay!!!! So so happy to hear it Andrea, thank you! So glad you’re loving them! Amazing, my daughter who is not a fan of trying new foods, at first told me she would not eat them and then ate 4 and asked when we were making them again!!! Big hit, I did add an extra pinch of garlic and cumin and they were delicious. Easy work week meal. So thrilled the flautas were a hit! Thank you! Can you make these and freeze them for another time? How would you do that? Thinking of making these for a friend of mine that is a new Mom! Want to give her a meal she will love that she just has to heat up! Thank you! Lauren you are so sweet! Yes they’d be great new mama food and they freeze wonderfully! They can be popped in the oven or toaster oven and baked from frozen! When I plan on freezing them, I like to partially bake mine for a just a few minutes to “set” them, allow them to cool, and then freeze spaced on a plate or baking sheet. Once frozen I pile them into a baggie for easy freezer storage. If using flour tortillas you could probably freeze without the partial bake time first — I feel like the corn tortillas do best with that mini-bake before freezing. place uncovered in center of oven. Bake frozen for 15-17 minutes until melty + crispy, turning halfway through for even crisping. LOVE these! I’ve made them several times. I sautee the veggies and I mix in the cream cheese to the sweet potato veggie mixture and then just roll it all together in the microwaved torts! My company loved this and asked for the recipe! You made perfection ! Thank you ! These are delicious! I followed the recipe as is. Very good. So happy you enjoyed them Bonnie! Could this recipe be any easier? Seriously?!? This recipe is full of flavor and short on work. It is incredibly flavorful and freezes well prior to baking. Another healthy freezer meal courtesy of Peas and Crayons! Thank you! My favorite meal! I can’t believe I haven’t written a comment on this recipe before, but it is probably because I printed it out long ago to have on hand because I make them so often. These have been a hit at many get togethers. I love that I can make up the mixture in 20 or so minutes and have leftovers to bake throughout the next couple of days. I use a larger sweet potato, half a red pepper, half a green pepper, and a full can of both black beans and corn. It makes so many! I love the crunch of the corn tortillas mixed with the melty cheese and potato-y goodness. SO SO SO GOOD! I will never stop making these. Do you drain and rinse the black bean? Yes ma’am! I’ll make a note in the recipe – great question! I make this ALL the time! It’s so quick, healthy and budget friendly! Highly recommend! Oh silly me. I forgot to mention I don’t add the peppers or cream cheese. But I do add the cheddar cheese. And I use Greek plain yogurt for dipping. Fabulous! OKAY FOLKS! These are good! I was surprised the tortilla shells were able to get nice and crispy! They are filing and very flavorful! I will definitely make these again. These are great for meal prep as well! Woooooot! Thank you Eryn! So glad you’re loving the recipe and that they’ll make a reappearance on your plate! My husband and I love these sooooo much! I used vegan cheese and corn tortillas, as I prefer corn over flour. Sweet, savory and filling! Just wow. Cant wait to make them again! Thank you Sandy! Corn tortillas are my favorite too! I made a double batch for dinner tonight and they were a huge hit! Even my pickier eater liked them. Is canned corn and canned black beans okay to use? Or what about frozen corn? Yes absolutely, Heather! Just drain and rinse and you’re good to go! If using frozen, simply saute or steam before adding them to the rest of the ingredients and you’ll be golden! These look so good! Do they hold up to freezing? If so, would you freeze them before or after baking? Thanks! Thanks Stacy! 🙂 They freeze like a champ! I typically bake mine for a just a few minutes to “set” them, allow them to cool, and then freeze spaced on a plate or baking sheet. Once frozen I pile them into a baggie for later. If using flour tortillas you could probably freeze without the partial bake time first — I feel like the corn tortillas do best with that mini-bake before freezing. Thanks for the great recipe. I have ventured off into the pescatarian/vegetarian world and have been searching for delicious recipes like this. I would definitely be checking out other recipes on your blog. Hey Was wondering can you freeze these? Hi Dani! You can absolutely freeze them! I typically bake mine for a just a few minutes to “set” them and then freeze spaced on a plate or baking sheet. Once frozen I pile them into a baggie for later. These were FABULOUS!! I made them last night and brought them to work for lunch today – everyone I eat with tried a bite and asked for the recipe! Delicious dunked in pico and guacamole 🙂 Thank you for the wonderful recipe – it’s a keeper! These were delicious!!!!! I used carb control flour tortillas and no cream cheese to cut down on the calories. OHemgeee!! Girl you r a genius. I made these the other night subbing most of the sour crm for plain Greek yogurt & doubling the taco sauce… It was an instant hit! Even my dad who won’t eat veggies & loves his processed foods loved this one. ? Topped with a little sour crm & a whole lot of salsa. ? Thank you for sharing !! This is now a staple in this house? I’m making this tonight! I’m going to toss in a some shredded chicken, just to make it even more filling! I love sour cream with my Mexican food but I’m gonna mix it half with plain Greek yogurt, half with sour cream, and toss in some cilantros and lime juice. I’m excited to use my wire rack for cooking instead of cookies! Just tried this recipe for dinner with some friends. They were a huge hit and so easy! Thank you! Made these for dinner. Yum!!! I intended to eat 2 and forced myself to stop at 4. My 10 year old licked his plate clean too. I made these a couple days ago for the first time and my husband was over the moon for them! Absolutely loved them and so did the rest of the family. It was tasty and easy to make which are winners all around! It will definitely be a regular meal in our house now. I have a butternut squash to cook. I wonder if I could use that rather than the sweet potatoes? I made these tonight and really loved them! I had enough filling for 12 and my family ate every last one! The tortillas were perfectly crisp and the filling had a nice savory sweet flavor with a touch of spice. We dipped them in sour cream. Thanks for the recipe :). Made these last night for dinner! Really enjoyed them topped with shredded lettuce, tomatoes, low-fat sour cream and salsa! My oven runs hot so I just had to lower the temperature so the edges of my flautas wouldn’t burn. Great recipe! SO delicious! I used kidney beans cut in half instead of black beans because there was none at the store I went to. Used mozzarella cheese grated with cream cheese. Threw in some jalapenos to the veggie mix too. SO DELICIOUS. My fiance is super picky and he only stopped eating them because he couldn’t fit anymore in! Love it. Thanks for the recipe! The tortillas in the micro worked great and oil on one side of them worked to toast them up nice and crispy! These were super easy and super yummy! My picky husband even likes them! Thanks for the great recipe!!!!! We tried these today, and yum! My husband doesn’t like black beans (he reminds me of this whenever I try to make something with them) and he ate three while watching the football game – then three more for dinner. My 7-year old ate two for dinner without stopping! Of course, I put in more filling than you did, so they were more like mini burritos than tacos, but still quite tasty. Next time I’ll control myself and get them the right size. Yay!!!! Total dinner victory – love it Heather! Burrito-fy them all you want – I stuff the filling into taco shells sometimes and totally go the overflowing route too 😉 So happy you all enjoyed them! Yum! I subscribe, but I was combing pinterest for taquitos/flautas, and I got all excited when I realized this one was yours, lol. Also pinned it on Pinterest. Sharing the love! These were divine! We only had six corn tortillas, so I saved the extra filling for tomorrow to use in some whole wheat burritos. I used salsa verde that I had left over from the black bean soup recipe (another fave), ancho chili powder, Southwest Blend frozen corn, and some nondairy jalapeño Jack style cheese, and served them on a platter covered with sliced romaine and diced tomatoes and added some chunky style salsa on the side for dipping. My husband ate four of them! Very easy and VERY tasty. Loved the crispiness of the tortillas. My husband asked what I did to them to give them a little bit of a sweet taste. Can’t wait to make these again! Thanks so so much!!!! I’m so glad they were a hit! You’re making me want them again for dinner tonight! #totallyhappening! These are delish! My whole family enjoyed them. I think I’ll try them with flour tortillas next time though. Thanks for a great recipe! Haha yay!!! Hope you loooooooove them! I was anti-microwave for ages and didn’t cave until our first big kid house came with one and I fell victim to the convenience! Nothing beats oven baked though! <3 go you! Absolutely! Bake times might vary a teeny bit so keep an eye on them so they don’t burn and you’re good to go! I only have flour tortillas on hand, think they would still work fine? Thanks! Just wanted to let you know that I tried this recipe, and love it! Posted it on my blog, and linked you to it 🙂 Thank you so much for sharing! ahhh gotcha! Sorry about that! I tend to like the texture of slightly al-dente vegetables but realize everyone has different tastes! I’ll update the post for you an add that in as a note. Thanks for the feedback! I’m so glad the trick worked and happy you loved them too! Thanks Janette! That’s fabulous news! I’m so glad you all enjoyed it! Thanks Samantha! Ahhh that’s great! Thanks Emily!!!!! The Saint Louis University Dietetic interns LOVED these! We had an early Cinco De Mayo party last night and I brought these- they did not last! I made these for my very picky (and strictly organic) 19 month old and they were a hit! I should add my husband and MIL loved them also. I omitted the cayenne pepper, used mild green chilies with regular sweet corn in place of the fiesta corn and sautéed the onions before adding them. I also didn’t use cream cheese. They turned out fantastic! Thank you so much for the recipe. This was amazing! Thank you so much for posting! Absolutely loved it! These were amazing! I turned mine after 10 minutes for even browning but the oil spray and cooling rack backing trick worked perfectly for me! Thank you for this! I made these and they didn’t come out so good. The onion and peppers did not cook all the way through; not even close. I turned my oven down to be able to bake them longer because of this, but the tortillas got crispy way too fast at 425. I recommend sautéing the peppers and onions a bit before combining everything. And specifying how to cut all the vegetables would definitely help (e.g. peppers and sweet potato). I made these tonight and they are amazing! Can’t wait to try more of your awesome recipes! These were amazing. Love the sweet potato! Just made these tonight. Delicious and very filling! Thanks for a great recipe. do you dice or mash the potato? I happened upon this recipe on Yumprint. I marked it because we wanted sweet potato burritos for dinner. I didn’t actually plan to follow your recipe. Until I read your preview and I had to try it. What a great success!! It was delightful. For the first time in forever everybody loved it. Let me say it again, EVERYBODY LOVED IT!!! Thank you for posting and for perfecting. You made my day. Its our new family favorite. This was absolutely delicious! One of my 3 1/2 year olds gobbled his up, the other one ate five bites (which is a lot for her since I didn’t add any meat to it). Even my meat & cheese loving husband, liked these (and that says a lot)! I know it’s not vegetarian this way, but for breakfast I fried an egg and served it on top of one of the left-overs. Yum. Thank you so much for a healthy and delicious recipe. where does the cream cheese come into play? Mix it with the potato before adding to the black bean mixture or just cube it and mix in with the black beans/corn? It’ll work any which way! You can mix it in with the potatoes or even with the shredded cheese. It’ll all melt down together so whichever method works best for you should be perfect =) Hope you love them! Saw this recipe on Pinterest..added some shredded chicken and homemade salsa….so yummy!!!! Hubby liked them so much he had 5 for dinner! I’ve been waiting weeks to make these delicious looking things!!!!! They are AWESOME!!! Thank you so much!!!!! Love them, LOVE THEM!!!! Just had them….used some tilapia in place of the sweet potato…so good! And they were crispy enough without broiling. Just finished eating these- they are great! Thank you for the recipe!!! Just made these for dinner. BIG HIT! Thanks for perfecting this delicious recipe! I can’t tell you how happy I am that I found your blog. your recipes are just what i need now that the hot summer days are hitting us, and heavy oily meaty foods are just not cutting it for me on the hunger satisfaction meter. Last night I made the Mushroom and Brie soup, it was perfect and my husband couldn’t get enough. Today I made the vege flautas, these are pure gems and are so delicious, I might make more tomorrow, and sometime this weekend we will be having the salmon tacos(i bought a bag of 75 corn tortillas on purpose). Thank you for your amazing recipes!! These tasted good but the damp paper towel trick didn’t do anything for my sweet potato. It was shrivelled up and dry. AND mine did not stay rolled up, it was impossible to turn them over once on the tinfoil. Is there a technique to rolling these? I didn’t put toothpicks in because I was afraid they would burn in the oven. Erg. We made these tonight and they are a winner!! We are addicted to these. We have been eating them weekly for a month already. My husband begs for them! Will flour tortillas work for this recipe? That’s all I have in my pantry and I want to make these tonight!Thanks! They look relish! These look delish, and I want to make them for a party on Saturday. To minimize my flustered insanity the day of the party, I am curious if you think the filling would keep if I made it a day or two ahead of time and filled them and baked them the day of the party? In any case, thanks for your help, and I am looking very forward to trying them out! Absolutely! Making the filling ahead of time will work fabulously and save you prep time before the party =) While I love won-ton wrappers, they tend too cool down rather quickly and also don’t hold much filling in them, so the corn tortillas might be easier on you since you wouldn’t have to roll as many. They can also be sliced in half before serving depending on the number of guests! Let me know how the party goes! =) So excited you’ll be making these! I made these for dinner and they are yummy!! They also smell so good while cooking. Thank you!! Made these tonight….huge hit!!! Thanks for the great recipe, excited to try some different variations!!!! 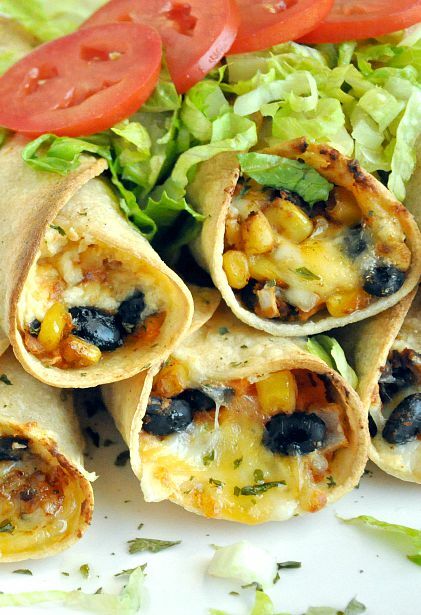 Can these be made with flour tortillas or are the corn tortillas a must? Ahhhh cue the happy dance! I’m so glad both of you loved them! Convincing picky eaters to faceplant into veggies is pretty much my main purpose in life =) Thanks Natalie! LOVE this recipe – Hot Habanero Cheddar is one of my favorites! Can’t wait to share it with my Cabot friends on Facebook. Made these on Saturday. Can’t stop thinking about them. Making them again tonight. Freezing pre-baking will work fabulously! So so so over the moon that you loved them! Thanks Lisa! Found this dish on Pinterest and turned it into a quesadilla. We loved the flavors and found it very filling. Thanks. ahhh yay! thanks Keianna! 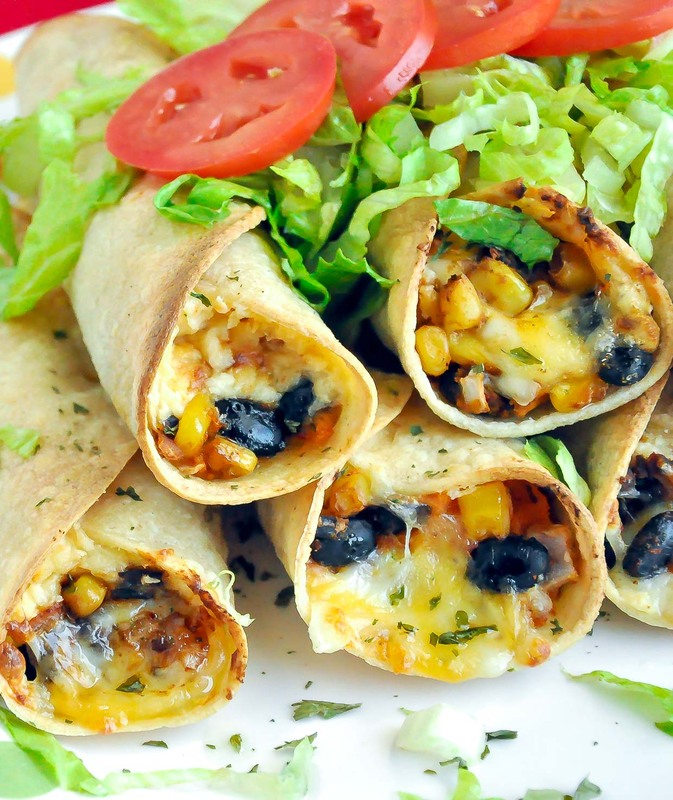 I adore it as a quesadilla and enchilada filling too – I’m so thrilled you like it! Made tonight and loved them as well! Found this dish on Pinterest and turned it into a quesadilla. Great meatless dish. Flavors melded well together and it was very filling. Thanks. I made these tonight, and they were delicious!! I added a small can of green chiles, because I love them, and I had to use flour tortillas because it’s what I had. My husband and kidlets devoured them, and asked me to put these “in the rotation.” Thanks for a great recipe! It’s midnight my time, and I am ready to get out of bed and go make this! Looks yummy! I know what dinner will be tomorrow! Thanks for sharing! Bahaha no sleep-cooking for you! Though it would be a little hilarious =) Let me know how they turn out! I’m so excited you’ll be making them!! eeeeeeeeeeeeeee!!!!! I’m so so glad! I’m smiling like a little kid that just found a cookie between the couch cushions – haha! Thanks Emily! Didn’t want to wait for dinner so I made them for lunch this afternoon! So delicious! Everyone enjoyed them! By far a new Fav! Thanks again for sharing! What is the optional cream cheese for? Do you mash the sweet potato or dice it up? Recipe looks delish, love mexican vegetarian recipes! I eat. A LOT! =) haha thanks Meghan — totally blushing over here! Seriously. How do you even live with yourself and all this ridiculous goodness. Your talent blows me away every time!! Yaaaaaaaaaaaaaay! I’ve been swooning over these bad boys after seeing you post them on Instagram. Holla! I will most definitely be trying these! I think even my sweet potato hater hubby would like them!! This is one of my favorite flavor combos!! 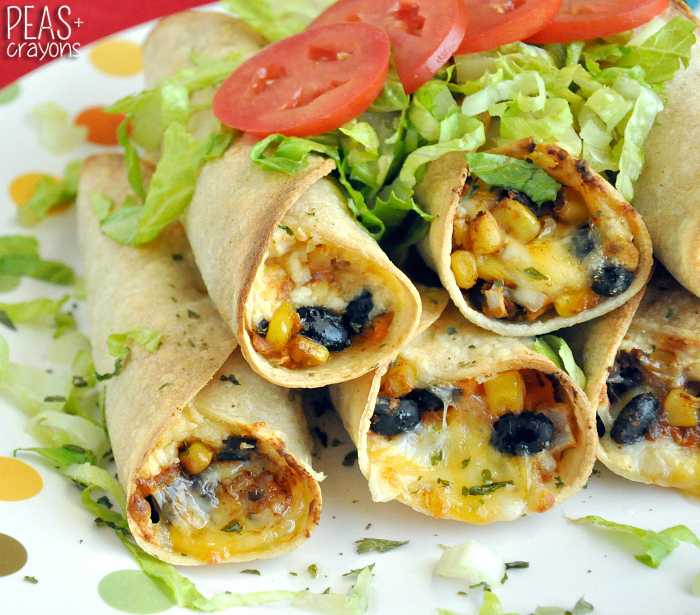 I’ve made black bean/sweet ‘tater enchiladas, but never flautas. Thanks for the recipe!! Ahh, you’re a saint for posting this recipe! I was drooling when I saw you post it on IG. Can’t wait to make these. Especially with all that cheesy goodness, yum! You’re making me hungry right now, and in the mood for EXACTLY those! They look scrumptious! Yum! Favor? Anyway you could put a “print” button at the bottom to make your delicious recipes easier to print out? Thanks doll! These look FABULOUS. I’m definitely going to give them a try this week! Ooooh….those look so delicious!! Much healthier then the flautas at a mexican restaurant. I love sweet potatoes! I am so excited for fall and winter weather to have an excuse to make more dishes with them. I need to stop reading your food posts at 10AM. It gets me too hungry for dinner!! I just realized I cannot read the word “flautas” without an accent. These look fabulous! Flautas are my favorite mexican dish!! I have been too intimidated to try at home just because I thought it meant frying in hot oil but in the oven?? I’m all over that!! OOh I’m excited. And hungry now.